The aim of this study was to review the experience of a single institution with the endoscopic Deflux® procedure and assess its effectiveness in the treatment of refluxing duplex systems. A retrospective review of all patients that underwent endoscopic Deflux® treatment for vesicoureteral reflux (VUR) in duplex systems between June 2003 and July 2007 was performed. Data collection included: age, gender, side of refluxing ureter, pre-operative radiologic grade of VUR on a voiding cystourethrogram (VCUG), presence of VUR on a radionuclide VCUG three months post procedure, volume of Deflux® injected, number of Deflux® injections performed per patient, and number of patients that underwent re-implantation surgery. Sixteen patients with duplex systems, two being bilateral, for a total of 18 duplex ureteral systems, underwent the Deflux® procedure. Grades of reflux were as follows: grade II – 4 ureters, grade III – 8 ureters, grade IV – 4 ureters, and grade V – 2 ureters. Deflux® injection volume ranged from 0.28 – 1.5 cc (mean 0.84 cc). Fourteen ureteral systems required one injection, three required two injections, and one required three injections. The overall success rate of the procedure after a maximum of 3 injections was 94%. One patient with pre-operative unilateral grade V reflux had persistent high-grade reflux after two injections and opted to proceed with surgical re-implantation. The mean follow-up was 24 months (6 to 48 months). 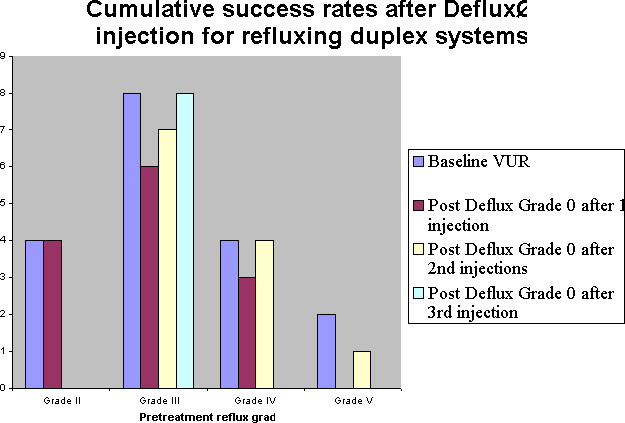 We conclude that the Deflux® procedure is a safe and effective minimally invasive treatment alternative for patients with refluxing duplex systems.